You Save: $26.96 (90%) Ships in 1 day. Soft Cover, 880 pages, 5x9. The Good Beer Guide is the comprehensive resource of the UK's best pubs—fromsophisticated city bars to cozy country inns, there is a pub for everyone in thisindispensable book. The pubs are all regularly surveyed by CAMRA members so youcan rely on this being the most up-to-date and well vetted of all pub guides. Discoverthe best pubs to visit in towns, cities, and the countryside throughout the UK. Foreach of the 4,500 pub entries you will find full details of real ale served, as well asdetails about food, entertainment, family facilities, history, and architecture. 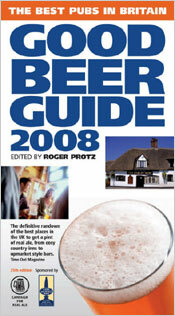 Theguide also contains a unique expanded Breweries Section which lists every brewerythat produces cask beer in the UK. Roger Protz is a journalist, broadcaster, and campaigner and the author of more than15 books about beer and brewing. He is the editor of the annual Good Beer Guide nowin its 32nd year. His awards include Glenfiddich Drink Writer of the Year 2004 andLifetime Achievement Award British Guild of Beer Writers.